We have now come to the final post about my food-heavy trip to New York! Laura and I have been friends since college, where we baked many things together. In the summer of 2006, we made a cake that neither of us have ever forgotten – the cannoli cake. We made it again in the fall of 2006. So for my visit two weeks ago, it was decided that the cake needed to be made again, 7.5 years later. Laura got all the necessary ingredients ahead of time, then we created the cake over two days because there are multiple steps. In fact, we ran out of mixing bowls. We’re extremely resourceful. 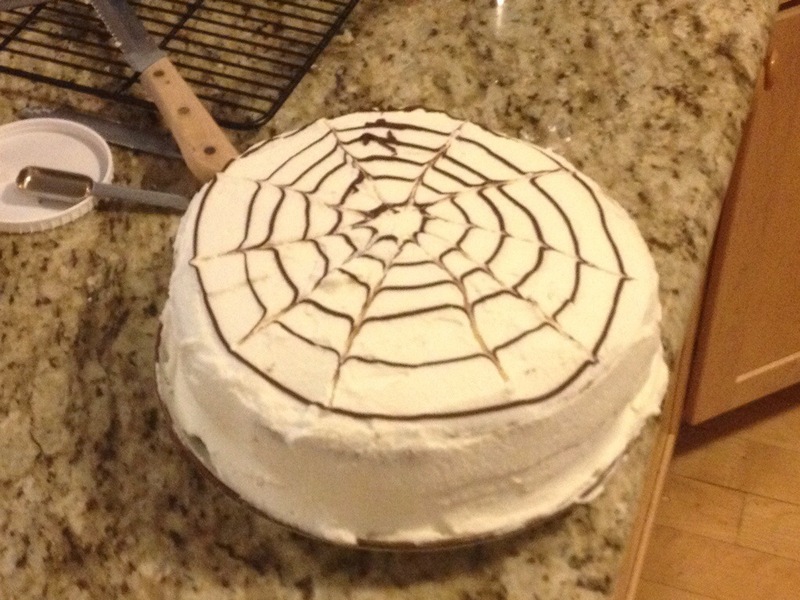 Another example of resourcefulness – there was extra icing that did not make it onto the cake. I had brought oatmeal chocolate chip cookies with me, and they got dipped into the icing before being eaten. Yum! After putting it all together, we came out with our third beautiful, delicious cannoli cake. I would love to know how we made it look so much prettier back in 2006. So, that was my trip to New York in a food nutshell! I hope you enjoyed reading about it! Coming up next, more homemade goods from here in North Carolina.